Once you have finished your visit to Tamworth Castle - and paid our gift shop a visit to pick up a memento of your day - there is plenty to do in our beautiful Castle Grounds. 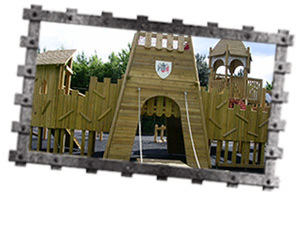 There is a fantastic children's play area which we can guarantee you will have trouble getting youngsters to leave! There is a great crazy golf course where you can have some fun navigating the obstacles and for those who are a little older, why not go and take a look at the skate park? You can also take a walk down the river to see some of the beautiful wildlife. And take ten minutes to visit the cafe near the play park to grab a cuppa and a slice of cake - you may even see the crown green bowls team enjoying a game. Don't forget to pay the town centre a visit - from shops and places to eat, while finding out more about our unique history and our characters! Just a few minutes walk from Tamworth Castle, through the fabulous grounds is a fantastic ten pin bowling alley which is great way to spend part of your day in Tamworth. Not only can you bowl there but there is a soft play area and also somewhere to grab a bite to eat. 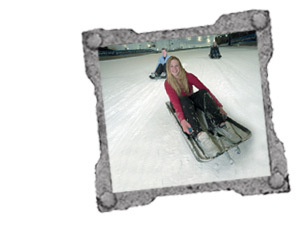 There is also the SnowDome which means you can go tobogganing, skiing or snowboarding on real snow! Or get your skates on and take to the ice! While just across the road from the SnowDome bowling alley is Ventura Retail park - so if retail therapy is your thing, why not take a browse from the huge range of shops? John Lewis at Home, Next, Next at Home, Marks & Spencer's and Toys R Us are just a few stores you could pay a visit to. You could spend hours losing yourself in the Castle Grounds! With beautiful floral displays to explore nestled between the stone steps, river walks, Canadian geese, swans and ducks to see paddling around in the two rivers, it really is a peaceful sanctuary. For those feeling a little more adventurous there is also bike hire and a crazy golf course. The cafe offers refreshment for when you would like to take a seat and relax - or why not bring a picnic and enjoy it on the riverbank? There are a number of benches all around the Castle Grounds for those who would just like to sit and enjoy the view! 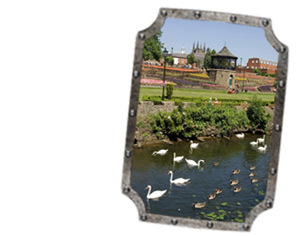 There are also guided walking tours which take place in Tamworth - the prestigious green badge guides now lead sightseeing tours of the town - it is not just the history and heritage the guides showcase to visitors, but the town’s characters and showing off what a wonderful town we have! visit the Green badge guides website. For more details and to book a place visit The Tamworth Information website which can give you more details on the guided walks and when they take place.